Last year I started out being exhausted by people who would still call the Arizona Coyotes the ‘Phoenix’ Coyotes. “Dollar in the Phoenix Jar,” I would say on twitter, in posts, in real life. Joking mostly, who would actually put money in a jar for saying Phoenix? Apparently, someone from the Coyotes staff said this to someone on the draft floor in Buffalo, that guy owes like $20 for that. But then I found a cause, dear and close to my heart. Research for Ependymoma and Glial tumors of the head and spine. Gus is a seven-year-old, extremely wonderful boy and has Ependymoma. Cancer is an evil disease and there is nothing I can physically to do make it better. But I can talk about it, I can fund raise, and I can come up with the Phoenix Jar. Last year we totaled the ‘violations’ and just from what I could see/hear it was around $100 total. $20 of that was from the Steve Dangle Podcast.$20 of that was from the Steve Dangle Podcast. I set up the twitter account @PhoenixJar, we tweeted about it but, nothing really came of it. In June, Gus was diagnosed as terminal. He’s very sick right now and again I am doing the Phoenix Jar. The team who tried to save him is using bits of the tumors they took out of his head, to further the research and possibly save the next child who is diagnosed. I met his mother Sasha because of hockey. We shared a mutual love of the Coyotes – she remembered them when they came to Phoenix. It’s fitting the Phoenix Jar is the fundraiser, it just feels right. The mission is to track who called the Arizona Coyotes, Phoenix. Be it in commentary during a broadcast, in writing (articles, Twitter, Instagram), refs during the game or even pressers. Make a note, tweet us, we’ll keep track. 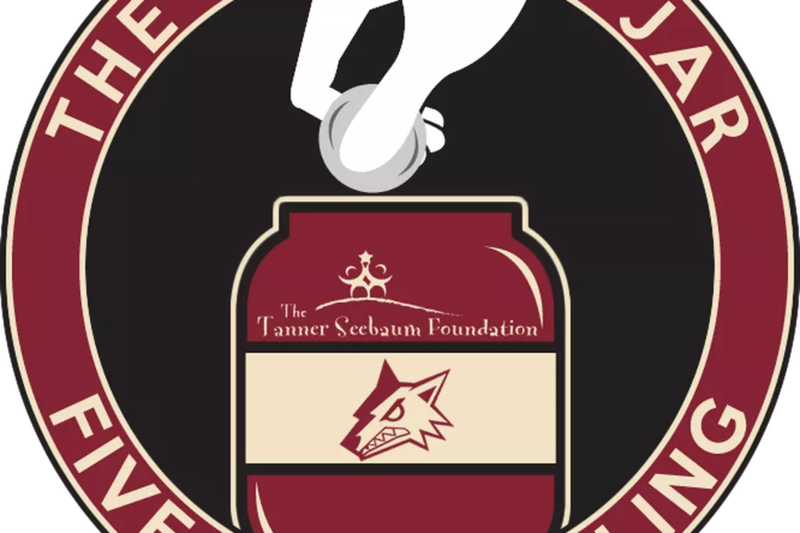 At the end of each month, we’ll set a total so far and at the end of the year, if you can donate as much as you can to The Tanner Seebaum Foundation, it would be the best thing in the world. They have a paypal donation button right on their website. Let’s light up the funding light. Hockey twitter can be a complicated place. Fundraising is either Movember or GTFO. I think this is something we can all participate in. Be a spotter, gleefully tweet about it, point out articles. Do something, every little bit helps. When Gus is gone, it will be the Gus Jar. It will be for all the players who has their name mispronounced, people still using Phoenix, calling an arena by its old name – anything to get our donation total up. Let’s make this a movement and not a moment. Over at Five For Howling we started this. Let’s turn a force of habit into something good. But Sarah, Why are you writing about this? It is the end of Childhood Cancer Awareness Month. I want everyone to be aware that, a month is NOT long enough. Cancer is an evil disease that has ruined so many families I know including my own. I will always #roar4gus and remember #therealgusandhazel. Previous Big Name RFAs Still Unsigned: How Much Will They Get?